30 years ago, Computational Fluid Dynamics was a topic reserved for PhD analysts or research groups at Universities. Fast forward to 2015 and CFD is accessible on the laptop (or even some tablets) for any engineer with SOLIDWORKS CAD. When we classically think of CFD, applications such as air flow over airplane wings or water flowing through a pipe come to mind. While these quintessential studies were the foundation of the development efforts, we can also study many common everyday scenarios. Earlier this week I was cooking some fish and vegetables (admittedly both were from a frozen bag). One of my main frustrations with the particular vegetable blend that I used was that the potatoes never come out quite right. Green beans…perfect! Fish fillets…perfect! 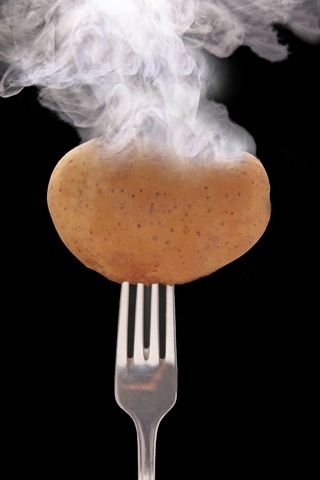 Potatoes…cold in the middle. Time to put on my engineering hat! The fish is sliced into thin fillets and the green beans are long and slender. Both of those geometries lend themselves to relatively high surface area to volume ratios when compared to the chunky potatoes. If only there was a way to figure out how long I should leave the baking sheet in the oven without forcing myself to eat fish for the next several weeks. Enter SOLIDWORKS Flow Simulation! While waiting for my current iteration to cook, I hopped onto my Dell M4800 at my dining table (a point of contention with my wife) and setup a virtual analysis. The first step will be to create an Internal Analysis because my oven is closed. Heat Conduction in Solids is a must since I want to see the temperatures of my food. Defining Gravity will show me how buoyancy is circulating the air. Finally, to see a Time-Dependent solution, we will enter the cook time and the intervals that we want to be able to check in on the food. From this point, we have many options to play with. To use my time most effectively (the DVR is begging my attention), quickly setting up a Goal Optimization will allow me to explore if the position of the potatoes on the baking sheet matters (i.e. if I spread them out vs. keep them clumped together) or if there will be a greater impact in changing the rack height in the oven. The beautiful part is that once I define these design parameters, SOLIDWORKS will chug along until it achieves my goal. Moral of the story is, CFD is not just for designing rockets anymore. Leveraging a transient thermal analysis, I can now enjoy my thoroughly cooked frozen dinner. This entry was posted on Thursday, March 5th, 2015 at 4:53 pm. You can follow any responses to this entry through the RSS 2.0 feed. You can leave a response, or trackback from your own site.